Do you know which is the Cheapest Smartphone is? If your answer is Freedom251, then you are wrong. Wondering Why?? 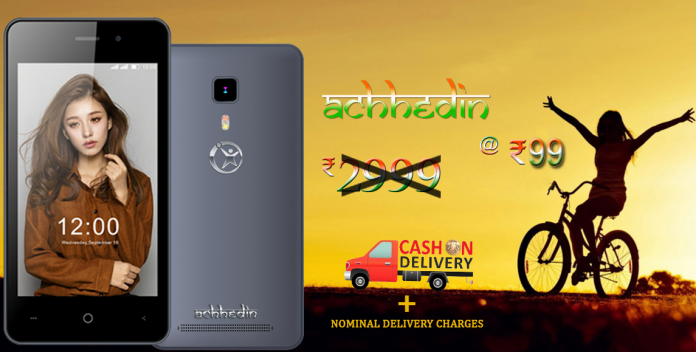 Have a look at the new cheapest smartphone named ‘Namotel Acche Din’ only for Just Rs.99/-. Yes, you heard it right. A Promoter named Madhav Reddy has claimed that he is marketing the world’s cheapest smartphone ‘Namotel Acche Din‘ for just Rs 99. He also said that the smartphone comes with a 4-inch display and 1GB RAM. It is powered by 1.3GHz quad-core processor and runs on the Android 5.1 Lollipop version. The rear side would have a 2 MP camera whereas the front camera is of 0.3MP. The dual SIM phone supports 3G and has a 1325mAh battery. The online registration for the smartphone would commence from May 17th to 25th May 2016. For registration you have to register with your details such as email and mobile number on bemybanker.com. After getting User ID and Password Logon to Bemybanker.com and Pay Rs.199/- for lifetime membership fee Using Payment Gateway. Enrol for the product from the website with the same ID and you will get a confirmation message. You have to Upload Passport Sized Photos and Aadhar Card details along with your address. The official website of the smartphone Namotel.com, showing that the price has been thrashed from Rs 2,999 to Rs 99 plus nominal delivery charges and buyers can also choose the cash-on-delivery option. Price of the phone doesn’t match the specifications but remember less priced products often long lasts for little time period. If you are in need go for them but don’t fall for the offers. The company has also added a special note on its website that, ‘Pictures shown on the website is for illustration purposes only’. Currently the official website is down may be due to heavy traffic of visitors.